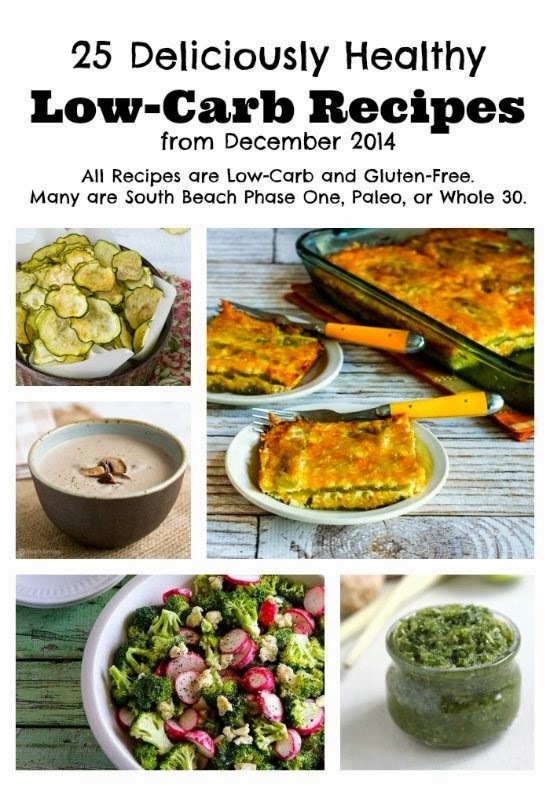 Here are the Deliciously Healthy Low Carb Recipes I posted or found on other blogs during December! Yesterday I announced a more mobile-friendly design for Kalyn's Kitchen, with a visual recipe index where you can find recipe by diet type. I wanted to mention that here, because the new ability to find recipes easily by diet type will be especially appealing for anyone who likes these Deliciously Healthy Low-Carb Recipes Round-Ups. Now you can go to categories like Low-Carb, Gluten-Free, or Paleo and see a photo of every recipe I've posted that fits that way of eating. There's also a category for Phase One Fridays, and there are a few other diet categories I am still working on. I hope that's going to be useful to people who are trying to stick to a certain eating plan!